My girlfriend periodically accuses me of not liking or listening to female singers. While this isn’t true, there is a certain element of truth to it. I am sexist in my listening habits. This is because I am a white male and have historically favored listening to white males (whether as solo artists, bandleaders, or in bands) sing. However, I will listen to anyone or anything that moves me as much or as often as possible. “PRIDE.” from Kendrick Lamar’s DAMN was probably one of the most underrated songs from 2017. Frank Ocean’s “Nikes” is my favorite song of the last 10 years. The album that has moved me the most recently is Julia Holter’s Aviary, but it will take me a lot longer to write about the record in any coherent way. But I am not hiding anything. If you look at my Spotify search history, if you look at my “Your Top Songs 2017” playlist you will see exactly the kind of person I am. Listening habits, routines, and rhythms are hard to break. The canon of rock music was built pretty much on narrow listening habits, outdated ideas about what is marketable, and also insufficient hiring practices. And I am guilty and complicit in devouring and participating in the canon’s status quo. We are only now thinking about how to revisit or revise that canon. I say all this because I actually do listen and love female singers. I just don’t listen to them as much as I should. For instance: Joni Mitchell. I barely or rarely listen to Joni Mitchell. Even when her health was failing and her life seemed in danger, I didn’t dive into her catalogue. “Free Man in Paris” is probably my favorite Joni Mitchell song, which again says a lot about me. But recently, I spent several October evenings hypnotized by a single Joni Mitchell song: “Amelia” from her 1976 album Hejira. I stumbled on the song after being served it as part of Spotify’s algorithm. I can’t even remember what album I had been listening to before the song came on and it doesn’t matter anymore—it was probably an album I’d listened to a million times. 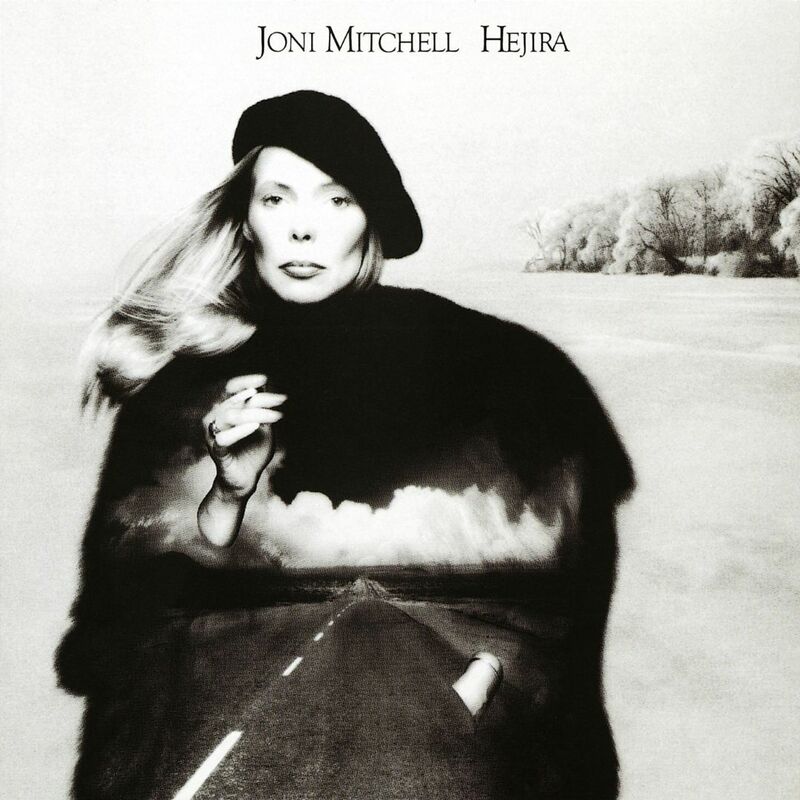 The album Hejira was released after and inspired by several road trips Joni Mitchell had taken across the U.S. at the end of 1975 and the beginning of 1976. It was also partly inspired by her breakup with drummer (and backing band member) John Guerin. Mitchell selected the title is an allusion to the Arabic word hijrah, which translates to “journey” and refers, very often, in specific to Muhammad’s migration from Mecca to Medina in 622 A.D. after a divine direction. “Amelia” is a delicate highway song. The first line begins with “I was driving across the burning desert” and immediately places you in the mode or mood of travel. Later, there is a line that reads “as the road leads cursed and charmed.” And in the last verse there is the striking, simple lines that go “I pulled into the Cactus Tree Motel / to shower off the dust / and I slept on the strange pillows of my wanderlust.” And when you listen to the track, you can see dust on a hood, the smatter of bug guts on the windshield, the glint of sun through the upper left corner of the windshield. You feel like driving, you feel as if you have just driven, or as though you are about to. Maybe I’m biased because I am American, but that sensation, of wanting to drive, of having just pulled off the road, or as if you are on the cusp of a long drive, strikes me as one of the most singularly American sensations. In a 1996 interview with the Los Angeles Times, Mitchell described the inspiration or intent behind the song as, “I was thinking of Amelia Earhart and addressing it from one solo pilot to another, . . . sort of reflecting on the cost of being a woman and having something you must do.” This theme of flight tracks neatly from the album title, to the song title, and to Mitchell’s biography. But the theme wouldn’t mean anything if it weren’t for some of those exquisitely written lines as well as the performances on the track itself. I’ve already listed out some of my favorite lines from the song so I won’t reiterate them. But just look at the way those lines “Maybe I’ve never really loved / I guess that is the truth / I’ve spent my whole life in clouds at icy altitude” scan and fall without music. You don’t need to hear Mitchell’s voice or any backing track or know anything outside of just those three lines to feel moved, to feel as something important is going on behind each of those words. As a piece of music, “Amelia” has such resonance because, or so I am told, it moves constantly between two different keys: F major and G major without resolving. I can’t explain to you what that actually means in terms of composition or music theory, but I can tell you what it feels like. Listening to this song feels like watching a calm body of water at sunset, as the red, orange, and pink light ripples across the surface with just slight flashes of gold. You look at the water and want to dive in—and you could if you wanted to, but there’s also a part of you that wants to stay dry because there are things you need to do, you can’t submerge, no, not now. So maybe you’ll walk up to the edge, you’ll kneel down, take your shoes and socks off and let the small waves lap your toes. Maybe you’ll reach your hands in and cup the water, and then just a splash across the cheek or along the forehead; a trail of water meandering slowly down off your chin, to fall gently on the neck of your shirt. A damp spot for a moment that will soon, and very quickly dry. That’s one way the song makes me feel, it also makes me remember when I drove across the country with my friends when I was only 19 years old. Before we left for the trip, our parents told us that it was good we were going on this trip because we may never be able to do it again. My friends and I told our parents they were crazy—we were only 19 years old, there were plenty of cross country trips in our future. But they were right: while there have been road trips scattered here and there, and brief visits, the three of us have never been together in such close quarters that way again. And I think about the way we searched for campsites in the dark, in the rain, the way we wore rain jackets and ponchos, and drank gin and cranberry juice with lanterns placed on tree stumps or picnic tables; I think of how we lay next to each other in sleeping bags in our tent, sometimes listening to wildlife walk by outdoors; I think about the way we bathed in streams with Dr. Bronner’s; I think of how we bundled up as the desert night grew dark just outside of the Grand Canyon; I think of the way we fought of the one speeding ticket we were given in Wyoming; I think of the girls we loved then, the cigarettes and mouth tobacco I used. I think of who we love now, who we are now, and what roads our lives are on now, where they are heading as we all sit firmly in our thirty-third year of life, more than thirteen years removed from that trip. “Amelia” is just slightly over six minutes long. It is hypnotic. Joni Mitchell plays an electric rhythm guitar, Larry Carlton plays lead guitar, and Victor Feldman plays vibraphone. The only misstep on the song is when there is an emphasized strum from Mitchell (I think) when she sings the line “it was the strings of my guitar.” Otherwise, every note, every bit of playing is done tastefully. As a vocal performance, it is perhaps my favorite vocal performance of all time, maybe even surpassing John Lennon’s performance on the song “God.” Mitchell doesn’t do anything more than she has to, she lets the lyrics lead her vocal in a way that seems conversational, but not in the way that singing or lyrics are usually described as conversational, which to me always suggests some level of contrivance. Here, it feels as if I am listening to someone who has thought very deeply about a subject speak to me directly and purposefully. In the Rolling Stone review of the album from 1977, Ariel Swartley describes the conflict within Mitchell’s music as “often her songs seem intent only on making private sense of her own experience. On the other hand, as a public performer, Mitchell wants to be heard and even enjoyed.” Maybe I am too generous, or maybe I just lack an ability to truly think critically, but I feel as though that conflict exists in us all, no matter what we do. Even in writing this blog post as a means to practice writing, I feel as if I am balancing an attempt to make sense of my own experience with a desire to be heard and enjoyed. For “Amelia,” because it remains musically unresolved, makes me think of all the selfish things I am capable of. The song touches a dark place deep inside of me, where vanity and fear rule, where nothing I have is satisfactory or good enough. And it makes me think of the friends I should have, the fame and recognition I should have, the beauty I deserve. It makes me think of the fact that at any given moment in a day, there is a part of me that wants to destroy everything in my life and escape. I don’t own a car, but I want to drive, I want to have driven, I want to be getting ready to leave. Because if I am moving then there is nothing to be accountable for, there is nothing to be lacking. Even if I am alone, I am alone by choice. I’m not entirely sure what Mitchell meant when she described the creation of “Amelia” as “addressing it from one solo pilot to another, . . . sort of reflecting on the cost of being a woman and having something you must do.” I don’t know what the cost of being a woman means. I won’t pretend to. When I watch my girlfriend remove makeup or describe all the processes that go into presenting herself as a woman to the world each day, I feel shame. Men have the luxury of not having to think about all the small things that women have to just to walk out of their doors each day. Instead, we think, like I do, of escape and of turning our backs on our current lives in favor for something better as if there is a dark romance to it. We think of destruction as something seductive, something a man has to do. But women want to destroy too. And women have a much better reason to. Because white men like me have wanted so much of the glory of history to ourselves. That’s not over yet, but I think one day it will be. Until then, I’ll keep listening to “Amelia” and wondering what the “cost of being a woman” means. Maybe I’ll understand eventually, even if I don’t listen to female singers as much as I should.